The night before, it had stormed, and by morning there is a cool mist shrouding Lookout Mountain. For an outdoor laborer, this means a reprieve from the oppressive summer heat. 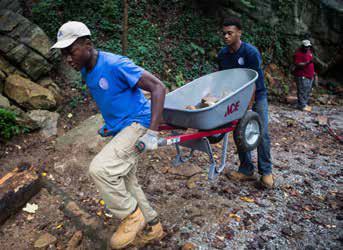 At the base of the mountain, 18-year-old Sayyid Muhammad fills his wheelbarrow with pickaxes, shovels and rakes. He starts up the muddy trail, followed by 16-year-olds Jwun Gamble and Laquisha Smartt, who carry armloads of rock. Less than a quarter of a mile later, the air changes. The mist clings to the skin like sweat.“My boots feel like they weigh about five pounds right now,” Muhammad says, attempting to kick the wet clay from his soles.This year, he will be a senior at The Howard School. Gamble and Smartt will be juniors. They are three of the 18 students hired to help plan and build a 50-acre park that begins on Old Wauhatchie Pike on Lookout Mountain and will eventually connect to the Tennessee Riverpark, with its terminus at the Incline Railway. The Howard Leadership and Intern Project is a partnership between The Howard School and Lookout Mountain Conservancy, a nonprofit land trust whose mission is to protect the mountain’s natural and historic resources for current and future generations. The Howard Project is directed by Conservancy CEO Robyn Carlton and program and office manager Creech Hardee. In order to be accepted into the Howard Project, students must provide three teacher recommendations, a copy of their transcript and an essay about why they should be chosen. They must also develop a plan for after graduation, whether it is to attend college or join the military or workforce. Those who choose college get to keep their jobs with the Conservancy, returning to work on their summer and winter breaks. Students are not selected based on who has the most impressive resume, says Carlton, but rather who has the greatest need. “Before the program, my summer was trouble. I was hanging with the wrong crowd. Instead of waking up early and doing something constructive, I was getting caught up in stuff I knew I shouldn’t be doing,” says 17-year-old Umar Muhammad. It is not easy. 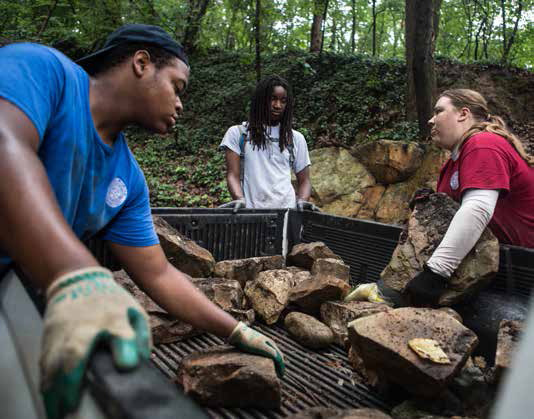 Hired interns work 40-hour weeks hauling rock, digging ditches and pulling kudzu. They are responsible for engineering drainage ditches to prevent erosion and hosting youth groups from all over the country. But the interns’ first priority, Carlton says, is to “walk across that stage. They have to graduate high school.” The partnership between The Howard School and the Conservancy began serendipitously. When the Conservancy first decided to build a park, Carlton wondered, “If we build this park, who will keep it up?” Income is often uncertain for nonprofits, as it’s largely dependent on grant writing. Like, for instance, the grant the Conservancy wrote to Tennessee American Water Company in 2011. In its proposal, the Conservancy asked for funding to help clear a ravine on its property and research runoff issues along the Chattanooga Creek water-shed. Unbeknownst to the Conservancy, The Howard School was also applying for a grant with the water company. The school wanted funding to test water quality in Chattanooga Creek. Recognizing the overlap of the two grants, in 2012, when the water company awarded the Conservancy $2,500, it asked the organization to work with Howard on its proposed activities. The initial partnership was called Environmental Connections. Carlton and Hardee collaborated with Howard teachers to bring students out to the property where they helped clean up trash, plant trees and study the watershed. Twenty-year-old Howard alumnus Antonio Woodall, returning for the summer from Tennessee State University where he studies aviation management, remembers it was through his high school environmental physiology class that he became involved with the Conservancy. 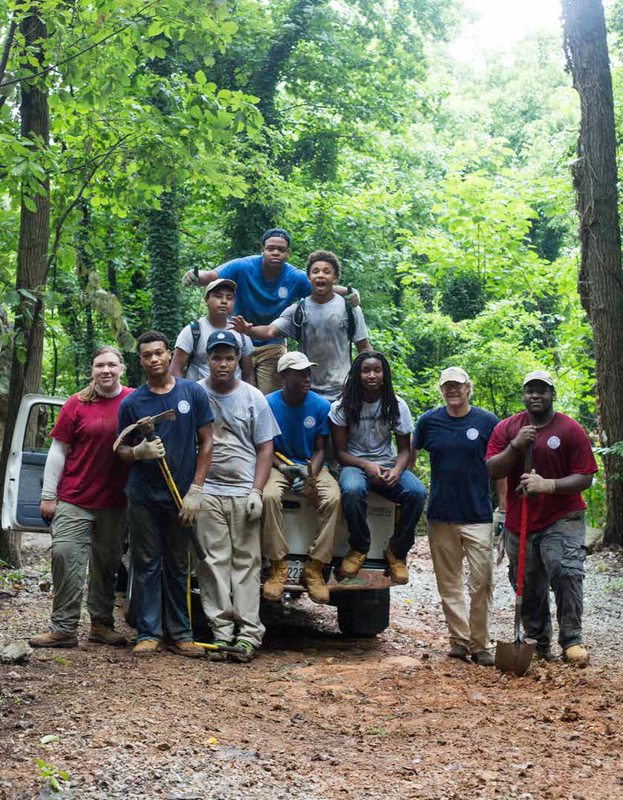 The day before it stormed, the students finished digging a drainage ditch alongside a steep south-sloping trail known as Laney Loop. Its function is to redirect rainwater off the trail and into a natural basin that connects to Chattanooga Creek. Now, on this sodden morning, the students get to see which sections of the ditch controlled runoff, and which sections need more work. First, Woodall says, they will shovel out any humps in the ditch to prevent pooling and flooding. Then, they will line the ditch with rocks to prevent it from washing away. However, Laney Loop is too steep for motor vehicles, so the interns must carry in the rocks from half a mile away. It can be tedious work, but the progress is definite.So far, the interns have cleared 15 acres of under-brush. They have freed 478 trees from kudzu and ivy. They have hand-cleaned and stacked over 36,000 bricks which will be repurposed for use in the park. But success is not always measured in numbers. “We cannot measure self-confidence, the breaking down of cultural and racial barriers, nor can we create data revolving around the influences that the interns project upon their peers,” says Carlton. She remembers the summer she started working with The Howard School. “Growing up on our side of town, we got a lot of gangs, kids our ages with guns. Every time you walk outside of your house you have a chance, you know, of something bad happening to you. But up here, you really don’t have to worry about things like that,” he says.“The two things that work up here are trust and safety. I teach the kids, ‘We’re the only ones out here. We can either make it safe or not safe,’” adds Carlton. 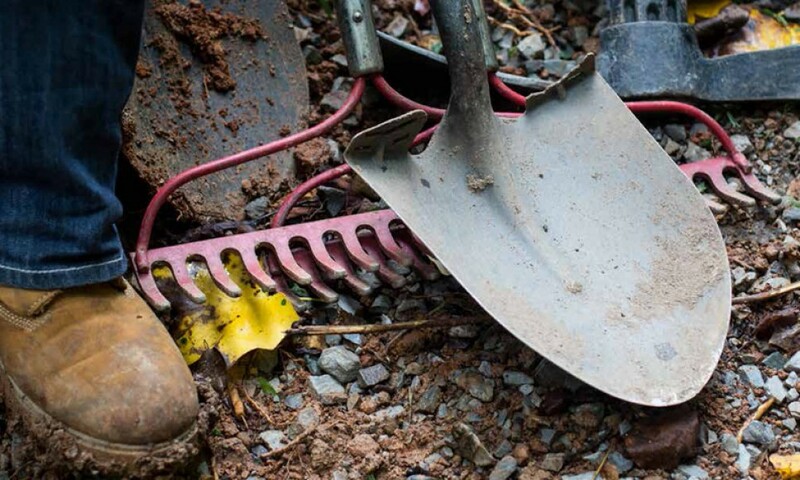 It is about more than just trusting a co-worker with a pickaxe. It is about emotional trust too, Carlton says. “I can’t really underscore how important trust is to the development of who they become as young men and women,” she says. The interns take the lessons they learn on the mountain back to their East Lake and Alton Park communities. From gardening tips like the importance of fertilizer — which Gamble says he taught to his grandmother — to team leadership, which Sayyid Muhammad says he takes to the basketball court. And so, Howard interns show up to class. They make good grades. They join sports teams. They stay out of trouble. And they plan for their future.“Our kids are considered the leaders of Howard,” Carlton says. You got it, you got it. You don’t even need me,” Sayyid Muhammad says to Gamble as he grabs the back of the wheelbarrow and helps hoist it up over the steepest part of the trail. Sayyid Muhammad says that he looks forward to work mostly because of his co-workers, whom he calls his brothers and sisters. He sings to himself as he slices the clay with the blade of his shovel. The interns agree, swinging a sledgehammer is a great way to relieve stress. Not to mention, eight hours of manual labor will keep a person out of trouble. “I sleep a lot more these days,” says Sayyid Muhammad. The interns also agree that what makes them most proud is their progress. 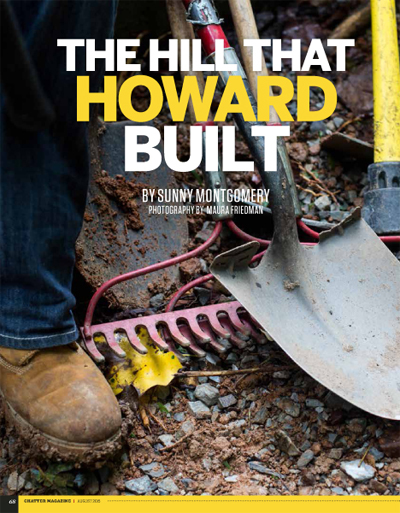 On a sticky summer morning, it is almost impossible to imagine how the hill once looked, covered up with decades of debris and downed trees, cluttered with boulders and wild with kudzu and ivy. He calls the trail a work of beauty — meticulously planned and as wide open as the rest of their lives. Read article via a PDF. Gamble remarks that he looks forward to the park’s completion. One day, he says, he will be able to bring his own family here to show them what he helped build. “Yeah, but you won’t be bringing kids up here for the next 10 to 15 years. You’ve got other things in life to accomplish before you start families, right?” says Carlton. The interns chuckle, nod and look down at their muddy boots. These students, Carlton says, have given new birth to the Conservancy. “We now know why we exist as a land trust,” she says. In 2016, there will be four graduating seniors, all with plans to go to college.